Hi everyone. I've been building a tilt-rotor quad-plane based around the Mini Talon (v-tail). As if that wasn't difficult enough I've decided to use the new Pixhawk 4 from Holybro which seems untested amongst the community. In my build, the front motor arm is a single rod connected through 2 bearings to one centralised servo so that I have no offset issues from using separate servos. I'm at the point now that I'm looking at the best airframe to use. From what I can see, there isnt a stock airframe that covers what I need so I'm looking for a little help on which one to load up please. I've tried to load the generic 'quadplane AAVVT' but for some reason I cant get the customised cfg and mixer to load from the microsd. On that mixer I change the order on the aux channels to AVVT (I have a Y cable for the Ailerons and T is for tilt on this one). Seems like I may be in over my head because I've hit a brick wall. Is there an airframe profile that would be better suited to my needs? I've seen some specifically for tilt-rotors but it seems they dont have V tail support as standard. I'm primarily a builder and flier and much less a programmer so I'm starting to struggle. Any help and guidance would be very much appreciated please. Is there an airframe profile that would be better suited to my needs? I'm not a coder either but maybe try the FireFly Y6 but only use four motors? I suppose you can just make sure that the proper rotation motors are plugged in the corresponding MAIN ports in the Pixhawk. I think there's a way to change the number of motors from six to four but am not sure. It would be best to post at the VTOL Slack forum. Or maybe the CruiseAder Claire. You'll have to see how it actually does with servos and ESCs. Thanks for the reply. I did look at the Firefly and the CruiseAder Claire but both seem to have elevon control surfaces instead of seperate ones for pitch and roll. I'm guessing they are based on wings. 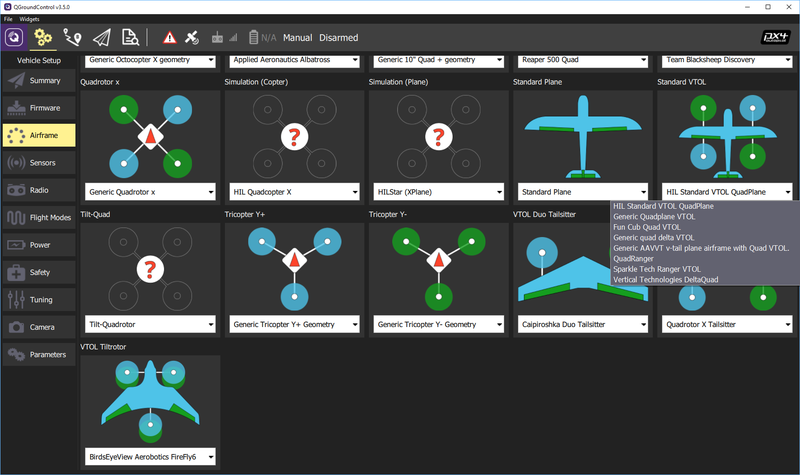 Just curious if the "Generic AAVVT v-tail plane airframe with Quad VTOL" is for this application?